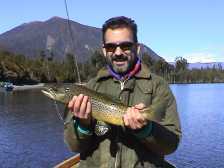 Fly fishing guide to Lake Brunner - the largest lake in the South Island's West Coast region, 7 miles across at the widest point, and some 22 miles (40kms) of shoreline. Much of the shoreline of Lake Brunner is clad in sandy beaches of white granite. This is a brown trout fishery, where the trout are both large and abundant. This lake has substantial areas of shallows, with prolific weed-beds which provide vast food resources for trout. Dragonflies, damsel flies, mayflies, caddis and midges occur in large quantities. The littoral zone on the mountainous sides of the lake is much narrower, sometimes only 20-30 feet from beach to the drop-off into deep water, and trout become concentrated in those sections through summer, As well as the aquatic insect harvest, the terrestrial insect availability increases dramatically during summer months with the annual cicada hatches. As if that was not sufficient incentive to keep trout in shallow water, the smelt and Bully (like a sculpin) population also comes inshore to spawn in the beach sands through summer. Casting streamers to big trout hunting baitfish in shallow water is a real blast! There are 3 rivers and numerous small streams flowing into the lake, of these the Crooked and Orangipuku are most worthy of note from a fly fishing perspective. Our West Coast lakes appear black, with a tea-coloured tannin stain due to the rainfall's passage through the humus on the floor of the surrounding rain forests. However, water clarity can be deceptively high, particularly in Lake Brunner and Lake Poerua, with up to 9.5 metres, or 30ft visibility through the winter and spring! Cautious approaches are needed during daylight hours if fish are not to be spooked. Sight fishing is popular - this requires an adjustment for most visiting international anglers, many of whom have limited prior experience casting to visible fish - and big fish at that, by international standards. 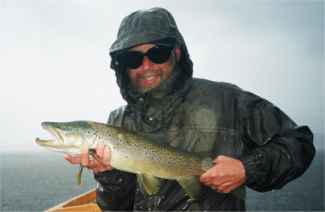 Regardless of the weather conditions... ...we can rely on the trout... ...in all shapes and... ...colours and sizes! Fishing pressure is low, especially away from the most popular lakes. The population of the West Coast is approximately 30,000 people. The majority live in the towns of Greymouth, Hokitika, Westport and Reefton, leaving the countryside sparsely populated in a region of some 2 million hectares (4.5 million acres) and extending from Karamea to Haast, a distance of about 600 kilometres, of 350 miles. Brown Trout only. Fish numbers are relatively high, with fish weights averaging 2.5 lbs, 18-20inches in length. 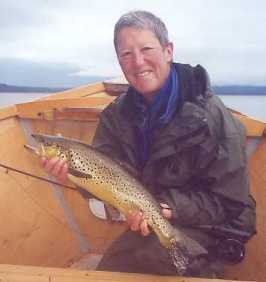 The Arnold River has, according to drift-dive surveys, a population of around 540 trout per mile. Fish of +5lbs (24-26 inches) are not uncommon. There are some rainbow in the Taramakau River 20kms south of the lake. A wide variety of fishing techniques are permitted by the local regulations. Productive fly fishing methods include streamers/lures on sinking lines, those imitating cockabullies, smelt or freshwater crayfish being best. Patterns include Hamill's Killer, Woolly Bugger and Mrs Simpson for day time use, Red Shadow, Black Prince, Black Marabou and Fuzzy-Wuzzy for evening and after dark. Red bodied lures have always been more effective than yellow or green. Smaller sizes (8-10) work better during daylight hours, bigger is better after dark (6-8). A nymph on a dropper under a big dry fly, drifted down river edges from the drift boat, is also very effective. Try a Royal Wulf or Stimulator on top, with Pheasant Tail, Hare & Copper or Hare's Ear are consistently successful. The "flashback" variations are also effective, sometimes more so than the plain. Nymph sizes need to be small in most locations - 12-16 are recommended. Lake Brunner Country Motels offers self-contained Chalet accommodation, and wonderful meals are available from the nearby Station House Cafe. Alternatively, stay in Greymouth (25 minutes away) at one of the very nice local hotels, and we can collect you daily to fish the lake and rivers around the district. A comfortable 2.5 hour drive from Christchurch International Airport, across the Southern Alps via State Highway 73 will get you to Lake Brunner. Alternatively, there a daily bus services (Alpine Coaches) which passes through Moana at Lake Brunner, as does the TranzAlpine Express train service which is highly recommended. Alpine Coaches can be contacted for bookings on free phone 0800 274 888. The TranzRail free phone for bookings is 0800 802 802. 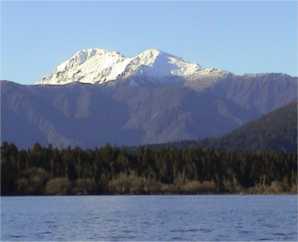 There are numerous Scenic Reserves, State Forests and National Parks within an hour or two of the lake. Paparoa National Park, home of the "Pancake Rocks" and blowholes, is only 45 minutes away. Shantytown, the West Coast Historical & Mechanical Society's gold mining museum, is also nearby. It is 2.5 hours drive south to Franz Joseph Glacier. 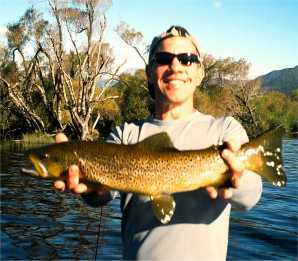 Lake Brunner and its outlet, the Arnold River, are fishable all year round. It�s tributaries, and adjacent lakes such as Poerua, Hochstetter, Lady and Kangaroo lakes all close during autumn/winter spawning periods. The main season ends 30 April, reopens 1 October each year. Most rivers running into the Tasman Sea are fishable from the river mouth upstream to at least the first highway bridge. 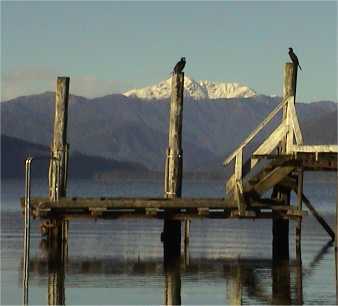 Others, such as the Grey, Taramakau and Hokitika, are fishable inland to the mountains. At the Moana, the famous Arnold River begins its 24km journey to its junction with the mighty Grey River. Renowned for its dry-fly fishing, and high trout stocks, access along much of its length is also constrained by steep banks, reeds, willows and scrub. This is serious brown trout fly fishing country!